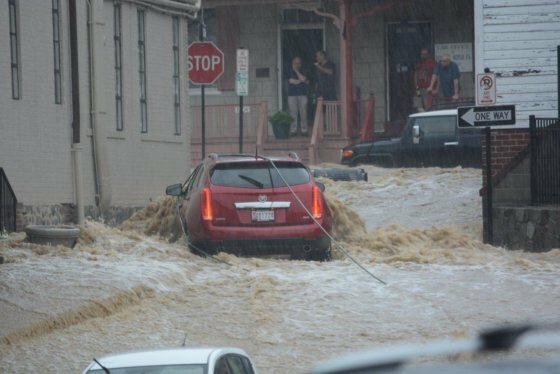 WASHINGTON — Rescuers have found the body of the man who went missing in the Ellicott City flood, the Howard County police said. The Howard County police confirmed on Tuesday that the body found in the Patapsco River was that of Eddison Hermond, 39, of Severn, Maryland, who was last seen at the height of the flooding that tore through Main Street of Ellicott City, Maryland, on Sunday. He was last seen trying to help a woman behind a restaurant while churning, brown waters ripped through Ellicott City’s flood-prone downtown. Hermond was last seen Sunday in the area of La Palapa restaurant on Main Street at approximately 5:20 p.m. Witnesses say that Hermond was attempting to help a woman who had escaped through a window with her cat, when he became swept up in the rushing water, according to police. He was reported missing to police at 12:30 a.m. on Monday. Gov. Hogan ordered Maryland flags to fly at half-staff across the state on Monday. Rescue personnel have been searching buildings and waterways in the area since the flood and there have been no other reports of missing people, according to police. The damage happens less than two years after business owners and residents were rebuilding from another massive flood that hit the area.